This smoothie for better skin is designed to provide plenty of the nutrition your skin needs to look its best. The recipe is full to bursting with antioxidants, healthy fats and specific nutrients to help prevent and treat acne, eczema and other forms of skin inflammation. Used regularly it may even help slow down the signs of skin aging caused by collagen breakdown, poor moisture balance and free radical damage to your skin cells. If you don’t have all the ingredients listed here the first time you make it don’t worry. The more you add the more powerful this anti-aging smoothie will be but even a few of these superfoods blended together can make for an effective internal skin treatment. Avocado is the richest fruit source of moisturizing monounsaturated fatty acids and including avocados in your diet regularly can do wonders for your skin’s appearance and preventing acne. The omega-9 fats in avocado help balance and maintain proper moisture levels in the epidermal layer of your skin, keeping it soft and subtle. Oleic acid in particular is involved in reducing facial redness and irritation and regenerating skin cells that have been damaged. If you are experiencing skin problems like acne, rough and dry skin or eczema, try getting more avocados into your diet. They are particularly great in smoothies as the fruit’s unique texture blended up turns this clear skin smoothie into the consistency of a dessert mousse. You can read more about the many skin benefits of avocados here. Kiwifruit is very rich in antioxidant vitamin C that also promotes collagen production. Collagen is the ‘glue’ that holds your skin cells together and when there’s not enough of it being produced skin starts to lose its firmness and tone and fine lines and wrinkles begin to appear. Kiwis taste great, either on their own or in smoothies like this and are a delicious way to get your daily vitamin C. A good dietary intake of vitamin C is also associated with reduced inflammatory acne lesions and faster healing of acne scars. Extremely hydrating, cooling and alkalizing to your body, cucumber is a wonderful vegetable for beautiful skin. The anti-inflammatory phytonutrients found abundantly in cucumber are particularly good for flushed or reddened skin and it is often recommended for acne problems. Cucumber is also very high in silica, often called the beauty mineral for its positive effects on your skin’s complexion. Eating more cucumbers is also highly recommended, though if you don’t like the taste they are barely noticeable in this smoothie for better skin and acne. Extra virgin coconut oil provides extremely healthy medium chain fatty acids like capric and lauric acid and many people find it beneficial for skin complaints like eczema and dry, flaky skin. A good extra-virgin coconut oil, like this bestseller I use, is not only great for smoothie recipes but is also a much healthier cooking oil than inflammatory processed vegetable oils that have been linked to acne problems and skin redness. Another powerful liver detoxifier, parsley is also excellent for kidney health and contains many nutrients for healthy skin. Just a small amount of parsley is a good source of vitamin K, trace minerals like zinc, copper and manganese and antibacterial and antifungal volatile oils. This herb is far too nutritious to be a garnish and brings a lot of health benefits when eaten regularly. Crushed up parsley can even be made into an effective external facial treatment for acne, dark spots and discolored skin. Not just for your eyes, carrots contain very high levels of antioxidant carotenoids that protect your skin cells from free radical damage that leads to skin aging. The nutrition found in carrots is also beneficial to your liver, the main organ of detoxification. An overworked liver tends to recruit your skin into helping get rid of toxins within your body. Including liver healthy vegetables like carrots in your diet regularly can make a big difference to the appearance of your skin. Few people have tried carrots in a smoothie, but, as long as you have a powerful blender like this one in my kitchen, they are a great addition for clear skin and less acne. Flaxseed is the richest source of omega-3 linolenic acid for reduced skin inflammation and better moisture balance. Fresh ground flaxseed also adds a satisfying nutty flavor to your smoothies and is an excellent skin food ingredient for many recipes. Flaxseed oil can also be used if you prefer with just a teaspoon needed due to its concentration. There’s more about the many benefits of flax and its omega-3 fatty acids here. Ayurvedic amla, also called Indian gooseberry, is one of the most potent antioxidant superfoods available and contains a broad range of flavonoids and other polyphenols for better health. Specifically for your skin, this study showed amla provided significant protection against free radical damage from the UVB radiation in sunlight that breaks down skin’s connective collagen and leads to wrinkles and sagging skin. Whilst being an effective detoxifier and free radical quencher internally, amla may be even more effective as an external facial treatment for skin complaints. These amla face mask recipes for better skin use the same amla powder that you add to the acne smoothie, making it a very versatile skin superfood. This organic amla powder is the best I’ve found to use in my smoothies and skin masks and lasts for many months even with regular use. This new Milkadamia is much healthier than regular cow’s milk with its estrogenic hormones and flatulence causing lactose. Some studies also show a higher association between drinking dairy and acne. If you don’t have it then either coconut water, coconut milk mixed half and half with water, probiotic kefir or real bio-live yogurt are all recommended over conventional milk for healthy skin. 1 small or half a large avocado. 1 tablespoon of extra virgin coconut oil. 1 small cucumber or half a large one. 2 branches of parsley, minus the stalks. 1 tablespoon of fresh ground flaxseed. 1 teaspoon of organic amla powder. ‘Milk’ of your choice to two thirds as high as the ingredients in your blender. If they’re not organic then soak the parsley and cucumber in a bowl of hot water with a small amount of apple cider vinegar. Shake off the parsley, cut off the stalks and throw the heads in the blender. Scrub the cucumber and carrots and chop them up into a size your blender can handle. Good blenders, like this bestselling model I use in my kitchen, can blend up even hard root vegetables like carrot and make it easy to get more healthy veggies into your diet. They are a great long-term investment in your health and deserved pride of place in your kitchen. Throw in your ground flaxseed or flax oil, amla powder and virgin coconut oil. 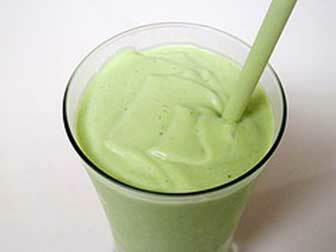 Scoop out the kiwifruit and avocado and add them to the blender. Top up the blender to about halfway up the jug with milk or another liquid. Add a few drops of a good stevia like this if you like it a bit sweeter without destructive sugar (strongly linked to inflammation throughout the body, including in the skin with acne). Blend it all up on high until everything is smooth, pour yourself a glass and sit back and enjoy the creamy taste of this anti-aging smoothie. Ideally drink this smoothie treatment for better skin right away for the best taste and most nutrients. There is quite a lot of it though so one good option I sometimes use is to freeze half of it straight after making it. This way you could have half during the day and then the remaining half in the evening as a very skin healthy frozen dessert. The avocado and coconut oil content makes it quite easy to scoop out of a cup, even after freezing, and it taste delicious this way. I hope you’ll give this clear skin and acne smoothie recipe a try. It takes a few weeks for new skin cells to really show through but I’ve personally noticed a real difference to my complexion since making up this smoothie regularly. I’d be interested to hear how it goes for you, particularly for acne, eczema and other skin complaints. There’s many other healthy superfood smoothie recipes to treat different conditions or improve your health and energy levels here. I look forward to getting your news-letters and tips Jim….thank-you. I read your tips on Triphala and decided to give it a go, so I ordered 400 x 500mg on ebay and have been taking four a day now for a couple of weeks, I don’t know whether I have any benefits from it except that I haven’t had the severe reflux I suffer from on occasion to the extent that my throat burns that badly I have difficulty in breathing until it eases off ( I now know what it must feel like to take arsenic poisoning). I will keep going with the Triphala keeping in mind to take a two week break at the end of three months. Thanks for your positive comments Shelly. Often it takes a while to see the full benefit of improving your digestive system but I hope the triphala can help with this. So I saw this smoothie recipe and I’m going to start using it. I have recently started some drastic life changes and I’m trying to live healthier altogether and my lifestyle changes have started rubbing off on my 6 year old son. When I saw this recipe I was ecstatic seeing as I’m coming up on 30 but I have a question. My son, as mentioned before, is 6 years old and has eczema and I was wondering if it would be okay for him to drink this smoothie as well? I saw that it was good for eczema I just wasn’t sure if it would still be okay seeing as he is so young. Also do you recommend any other smoothies or vitamins that would be good for him? He takes his daily gummy vitamin but I constantly worry about him getting all his vitamins and nutrients because when he is with his father for half of the week all he gets to eat is pizza, pizza rolls, fast food, and take out. I’ve tried speaking to him about these things but what I say doesn’t matter to him so I was wondering if there’s anything extra that I can do for him while he’s with me. He grows incredibly fast. I know all kids do but he is more than a head taller that all the kids in his grade. I’m 5’4″ and he stands up to midchest on me already so when I say that I consistently worry about his health that’s the understatment of the century. LoL! Hope to hear from you soon and thank you for your time! Everything in the smoothie would be fine for children and good for treating skin complaints like eczema. For nutrition smoothies are great for children as they taste so good yet are easy to fill with superfoods. For weight loss you could use a smoothie like this as a meal replacement as it’s very filling. The biggest key though is reducing sugary soda/juice and processed grain foods like bread and pasta. Thanks a lot for this smoothie recipe. I am currently taking a smoothie of avocado, kiwi, amla, parsley, mint leaves, spinach and 1/8th lemon with skin since last 15 days. And to tell you, I have definitely noticed a difference in my skin tone. Now I will add cucumber and carrot and virgin coconut oil too. Wanted to know if this smoothie will help for hair regrowth also. I am facing a lot of hair fall nowadays. Please send me your tips. Thanks for your positive comments. I’m glad the smoothie is improving your skin. Thanks Jenny. Glad you like it and hope your toddler does too. Hi Farah and sorry to hear about this issue for you. Hi Jim, I would like to know about super food that have higher healing properties and protein contained. I’m suffering from leg ulcers for 5yrs which is quiet difficult to heal without proper dietary intake and full blood supply to the ulcers. Please help me through this problem. Thank you. The superfoods I write about on https://superfoodprofiles.com are all very healthy with healing properties. I’d encourage you to read more articles on the site and see which you can incorporate more of into your diet. Is the amla fruit works the same? because I don’t have the power but I do have the fruit. The fresh fruit is even better if you have access to it. I have a couple questions regarding papaya seeds for a parasite cleanse but it seems those posts are so popular commenting has been turned off for them! So, sorry to comment here on a totally unrelated topic but I wasn’t sure where else to ask. I believe my partner most likely has parasites as he has several of the symptoms despite us eating a very healthy plant based diet. (I eat exactly the same and don’t have any digestive issues to my knowledge) I was wondering if it is necessary to follow the cleanse smoothie with a laxative? I haven’t got access to the ayurvedic one and im not super comfortable with him ingesting castor oil as there is some debate regarding that. Would he still be able to cleanse his body of parasites with just the smoothie alone? I realise the laxatives are there to potentially expel stunned parasites and get rid of them as quickly as possible but would your body effectively do that on it’s own? Thank you so much in advance and I love reading all your articles, so much valuable information! Can we add banana instead of stevia in this smoothie? Yes you can, though bananas are quite high in natural sugar which isn’t great for weight loss, though they do contain some nutrients for better skin. I find if you make a big enough smoothie it tends to encourage you to go to the toilet well so a laxative isn’t really needed if you are quite ‘regular’. Though if constipation is an issue then some kind of encouragement in that area is better. I agree that the breast feeding warning is often applied in a blanket way but am very cautious giving advice with anything regarding babies so would suggest discussing it with a healthcare professional. Great recipe, thank you very much for sharing it. Is this your own recipe? Can I recommend it to my patients at the clinic?